← Tots of Trinidad Halloween Parade! 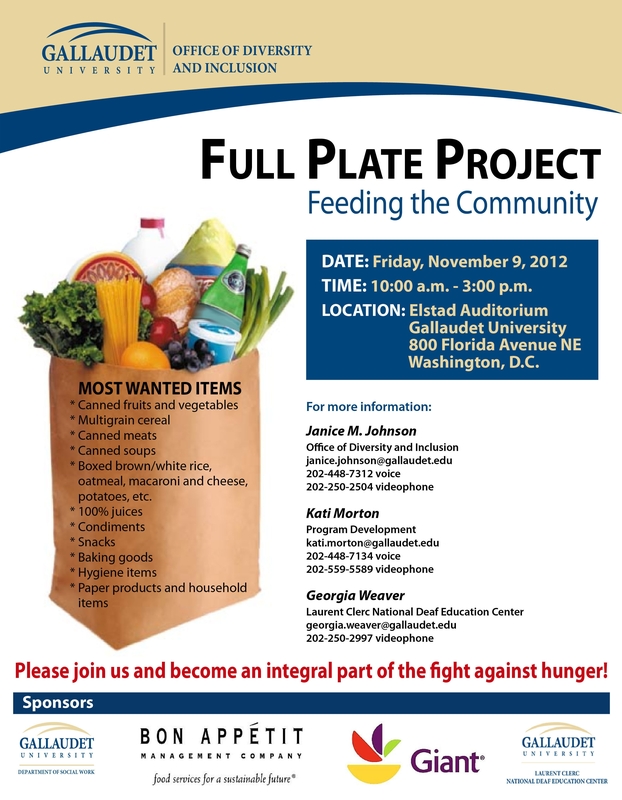 Gallaudet University, in partnership with Giant food and the 5th District Police Department, is holding a “Full Plate” food drive. A Giant food truck will be parked on campus, and the goal is to fill it up and then donate to those in need. If you’d like to donate non-perishable food items, you can head to Elstad Auditorium or drop them off to the truck, which will be parked near the 8th St. and Florida Ave. gate 10:00 am – 3:00 pm. Posted on November 2, 2012, in Events and tagged Gallaudet. Bookmark the permalink. Leave a comment.